With NVIDIA's Tegra 3 'Kal-El' getting very out-dated, it was about time NVIDIA released their upcoming SoC, the Tegra 4, codenamed Wayne, and once again NVIDIA has amazed us with the specs of their next-gen SoC. Wayne (finally) is NVIDIA's solution to some serious performance and efficiency flaws present on Tegra 3. First up is the CPU. NVIDIA has made some nice success with it's 4-PLUS-1 CPU architecture, introduced in Tegra 3. As a quad-core processor is expected to consume a lot of power, NVIDIA has used vSMP (variable symmetric multiprocessing) to couple those four high performance cores with one power saver core, which is optimized for very low performance, and therefore very low power consumption, and is made for handling light tasks. When the CPU's workload is low, for example, when the device's screen is off, or when a video is being played, the four main cores can be power gated, and all processing is transferred to the fifth power saver core, until such time when the workload increases. This dramatically increased the battery life that Tegra 3 devices could offer. 4-PLUS-1 is very similar to ARM's big.LITTLE concept. Since this technology has benefited NVIDIA greatly, 4-PLUS-1 carries on to the Tegra 4. Power saver core aside, the Tegra 4 will have four state of the art ARM Cortex-A15 cores. This means a serious amount of processing power. The Google Nexus 10's CPU has two Cortex-A15 cores, and yet it has by far the best performance in any mobile device. Based on that, we can assume that Wayne will really be revolutionary to mobile CPU performance. Not to mention that previous leaks suggest that Wayne will run at clock rates even larger than that of the Nexus 10's CPU, pushing the performance envelope even further. Another impressive feature of Tegra 4 is the GPU, which isn't a surprise, considering NVIDIA is the leading PC GPU company. NVIDIA is promising 6 times the performance of the Tegra 3's GPU, and twenty times the power of Tegra 2. While the Tegra 3 has 12 GPU cores, Wayne's GeForce GPU will have an impressive 72 GPU cores, which, at the Tegra 3's clock rates, results in a total of 72 GFLOPS performance, which is close enough to the 77 GFLOPS the PowerVR SGX554MP4 in the iPad 4 can do, and should also beat by far the current Android GPU king, the Mali-T604 inside the Nexus 10. Hopefully, NVIDIA was smart enough to use an unified shader architecture for this GPU, and discarded the very dated discrete shader architecture in the Tegra 3. Previous leaks had indicated that Wayne's GPU would be built on NVIDIA Kepler technology. Despite being a very exciting prospect, these leaked specs don't mention Kepler at all. It also doesn't mention whether Wayne will support CUDA. One feature that has always been crappy in the Tegra series, and has always seriously bottlenecked performance, is memory bandwidth. While pretty much every other SoC manufacturer was using dual-channel configurations for their memory controllers, Tegras 2 & 3 sticked to a very weak single-channel memory interface. Thankfully, NVIDIA has fixed that with Wayne, for the SoC will support dual-channel memory controllers from LPDDR2 to DDR3L. On the best case scenario, that is, dual-channel DDR3L, the Tegra 4 should have memory bandwidth close enough or equal to the Nexus 10's Exynos 5250 chip and the iPad 4's Apple A6X chip. It's good to see that NVIDIA has finally done away with one of Tegra's main bottlenecks for performance. It looks like NVIDIA is also pushing the ISP (Image Signal Processor) envelope with Tegra 4 too. The leak shows that Wayne will have Super Speed Imaging, which will allow for more than 350 Mpixels/sec ISP speed. It also seems like Tegra 4's display output capability also improved. Not only does the SoC allow for high resolution 2560 x 1600 displays, it also can output to 1080p displays at a sweet 120Hz refresh rate. Impressive enough, but that's not all. Tegra 4 can even output 4K display resolutions. To wrap it up, NVIDIA is also offering some advantages also in terms of thermals and power consumption, by making the move to a 28nm process. This is a big advancement for Tegra, considering that the last-gen Tegra 3 was built on 40nm process, the move to 28nm is quite a leap. 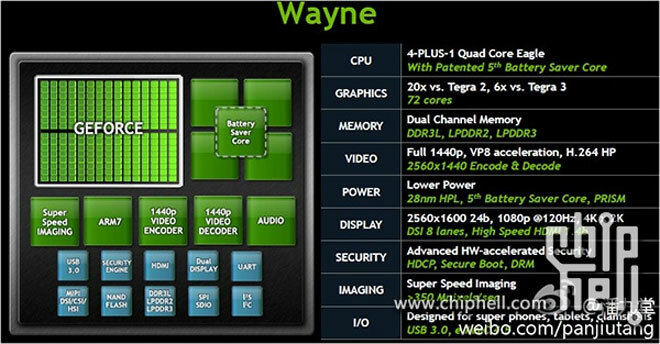 NVIDIA's Tegra 4 'Wayne' is going to be officially announced in Janurary 2013, at CES (Consumer Electronics Show), and then, hopefully it won't be long before we see this amazing new SoC inside an actual device.